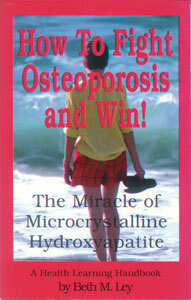 How to fight Osteoporosis and win! Get the facts about bone loss, calcium, dairy products, and calcium supplements. Find out why most calcium supplements do you no good. Find out why a natural supplement, MCHC (Microcrystalline hydroxyapatite), is superior to all other calcium supplements. It has clinically proven to restore lost bone!